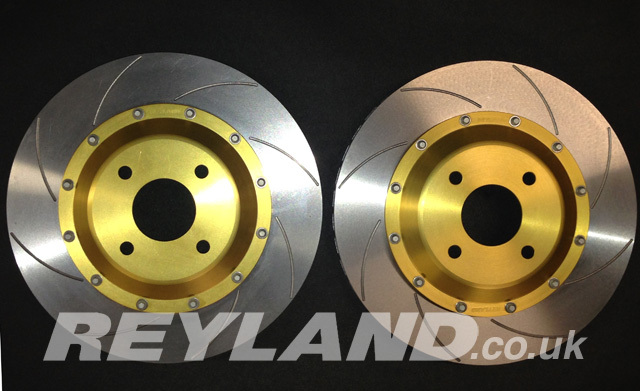 The Reyland Sport front brake conversion features 324x28mm two-piece discs and Reyland billet cnc machined alloy bells. The kit is supplied with all required parts including discs, bells and AP Racing disc to bell bolts. These are a direct replacement for the OE one piece discs and are designed for use with the original Bremo calipers. The Reyland Sport front brake conversion features 343x28mm two-piece discs, Reyland billet cnc machined alloy bells, caliper relocation brackets and all required parts. These are a direct replacement for the OE one piece discs and are designed to work with the original Brembo 4 pot calipers. Fits inside the standard 18" wheel without the need for spacers. Very minor caliper modification may be required to the leading and trailing edges of the caliper where the disc passes through, this is a two minuite job and is in a place thats unseen. Disc surface options: plain, straight grooves, curved grooves or J hook. 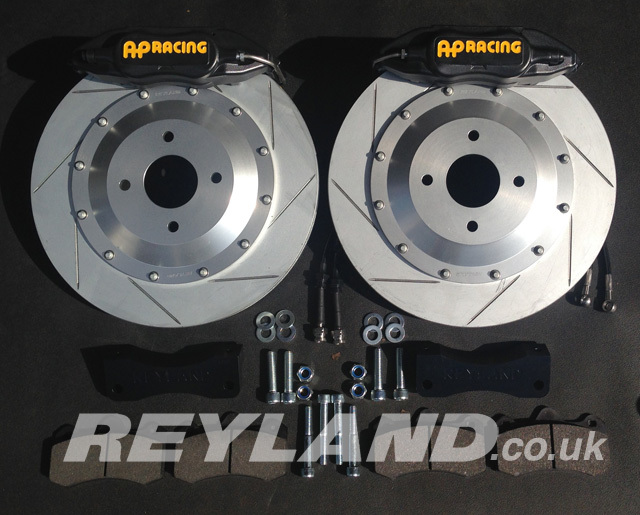 The Reyland Track 350 front brake conversion features 4-piston AP Racing CP6600 calipers, two-piece 350x30mm rotors, billet alloy cnc machined Reyland mounting brackets and bells. The kit is supplied with all required parts including discs, pads, AP Racing disc to bell bolts, brackets, braided brake hoses and unions. Fits inside the standard 18" wheel.